Chief Assist. 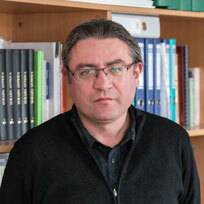 Dr. Boyan Dumanov has been the acting Chair of the Department of Archeology since 2012. His research career started at Sofia University “St Kliment Ohridski” (1999–2003) where he defended his doctoral thesis in 2003. In 2004 Dr. Dumanov became a full time lecturer at the Department of Archeology at the New Bulgarian University, setting the Department policy of attracting young and promising researchers. Dr. Dumanov’s research interests are mainly in the field of Late Antique Archeology, the Great Migration, Medieval Bulgaria and Byzantium and focus mainly on issues of applied arts, ruler ideology, ethnic identity, settlement patterns and migration. In recent years, Dr Dumanov has been particularly focusing on the interaction between politics and archeology, the influence of the political status quo in archeology and science as an object of political action. Dr. Dumanov’s research projects are mainly related to archeological field research generally in mountainous and hilly areas. Among them are the micro-regional research activities in the Sredna Gora mountain area of the late antique and medieval village complex and early Christian cult center at the village of Novo Selo, municipality Bratja Daskalovi and the international project “Uncovering the upland zone archaeological heritage: a case study from the Mirkovo Basin, Bulgaria”, in collaboration with the University of Durham, UK, funded by the America for Bulgaria Foundation and the Central strategic development fund under the Board of Trustees of NBU. Dr. Dumanov is a member of the research teams of the project “ARCITEC” (Archeological center for interdisciplinary technologies for documenting and interpreting monuments of cultural and historical heritage) agreement № D02-68/11.12.2008 (2009-2011) and the project “Optimization of activities of Bulgarian museums with children and young people”, funded by the America for Bulgaria Foundation, agreement № ART.00012.20090904 (2010-2011). • Netherlands Institute in Turkey, Istanbul, project “Guide to the Byzantine Archaeology”. The Chair of the Department of Archeology has an UNESCO fellowship and from the British Academy. He is the author of over 50 research publications.